If you’re tired of spending night after night at a Grafton Group Restaurant or sick of wandering up and down Mt Auburn St searching for a party, look no further. The Sinclair, a new concert venue and restaurant located at 52 Church St., has opened to the Square. The Sinclair is the newest concert venue backed by The Bowery Presents, the New York-based booking company behind such iconic spaces as the Bowery Ballroom and Terminal 5. Now, for the price of a movie ticket, you can go see a concert in the Square and possibly splurge for a nice meal afterward. The food will cost a little more than, say, Bertucci’s, but The Sinclair offers a much better atmosphere than an Italian chain restaurant. 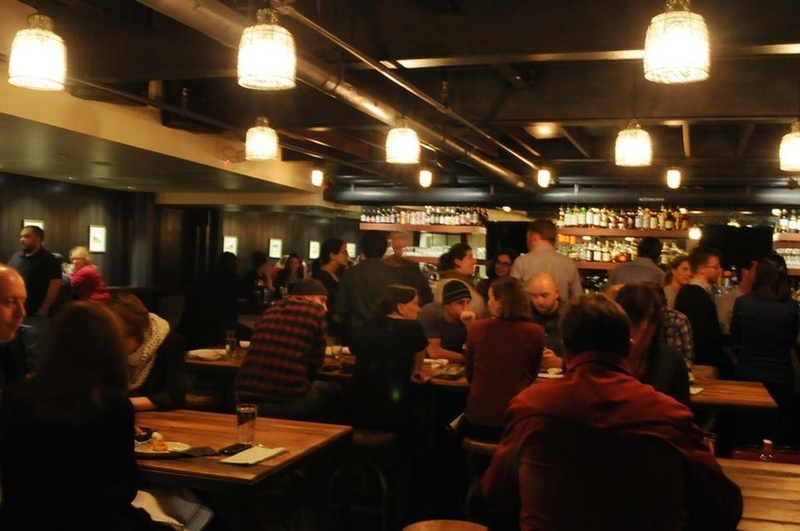 The Harvard Square location presented a unique challenge to The Bowery Presents because of Cambridge’s puritanical liquor laws, which forbid nightclub licenses; businesses cannot serve alcohol without food. In the face of such restrictions, Bowery decided to go into the restaurant business at The Sinclair, a bold move for a company that had never done so before. The resulting space—part restaurant, part concert venue—provides a unique addition to a Square in need of new nightlife options. Though Harvard Square lacks nightclubs like New Haven’s ubiquitous Toad’s Place (or even a movie theater, for that matter), The Sinclair concert venue may fill some of that void with a large wraparound balcony, a maximum capacity of 525 people, and, most importantly, three bars. “The idea behind the [concert] space is to be able to have views from everywhere,” says Josh Bhatti, the head of The Bowery Presents: Boston, who spent two years working on The Sinclair prior to its opening. According to Bhatti, the large stage and balcony allow the audience to get as close to the performers as possible, in order to “concentrate the energy” of the room. Indeed, the stage seems massive. It’s hard to believe that this space can fit right in the middle of the Square. With its relatively small capacity compared to other concert venues, The Sinclair will feature more up-and-comers than hit acts, but The Bowery Presents’ connections within the music industry have allowed them to plan for about 200 events per year in the space. “A lot of the bands are coming to us,” Bhatti says. Recent performances include a New Year’s event with Deer Tick and a sold out Duncan Sheik concert last week. Bhatti also advertises that The Sinclair will be available to rent out for events on the nights without planned concerts, which could present exciting opportunities for student groups constantly in need of venues for theatrical productions, charity fundraisers, or social gatherings. Also, it has three bars. Bhatti partly attributes this positive feedback to the staff’s friendly demeanor. The bartenders are trained to be inviting, he says, and there are no bouncers at the door. Instead, the event staff check ID’s. “People act how they’re treated, and if you walk in and the guy at the door is just a bully or a meathead, it makes you feel you have the ability to act like that too,” says Bhatti. Yet getting to opening day at The Sinclair was not a seamless process. The venue’s many construction delays reached comical levels, preventing the venue’s opening by over a month and leading to the creation of a Tumblr called “The Sinclair is Not Open.” The fact that the restaurant’s opening fell in the middle of January right after the holiday season was not ideal, Bhatti assented, but luckily business has been good thus far. Bhatti chalks up the delays to the widely held desire to get everything absolutely right in both spaces. “We wanted a space that would last, we plan on being here for a long time,” Bhatti says. In order to attract students, the Sinclair has worked to provide affordable concerts and meals for its patrons. According to Bhatti, 80 percent of the concerts at the Sinclair cost below 20 dollars. “We wanted our prices to be accessible so that people can come back multiple times,” Bhatti says. In addition, very few concerts have a 21-plus age restriction, making it easier for students to attend. The restaurant has a transportation theme, complete with custom subway tiles and maps. Bhatti says he wanted the design of the space to have a connecting thread while avoiding “kitsch.” The Sinclair also sought to distinguish itself from the tavern feel of Grafton Group restaurants, and went with a more “bunkery” vibe, he says. The Sinclair will also be able to utilize its outdoor patio in the spring: take that, Charlie’s Kitchen! Bhatti pitches The Sinclair as a place to spend an entire evening—moving from the restaurant to the concert space—or to just stop by as one fun part of your night.